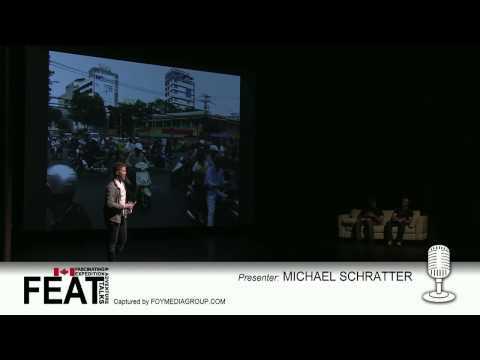 Michael Schratter is a teacher and columnist for Vancouver 24H. On August 1, 2010, he embarked on his Ride Don’t Hide campaign, cycling 40,000km solo through 33 countries and six continents to increase awareness of mental illness, combat the stigma surrounding it, and raise funds for the Canadian Mental Health Association BC. While cycling around the globe Michael published over thirty educational articles on mental health issues. In September 2011, Michael was honoured with CMHA BC’s Dr. Nancy Hall Public Policy Leadership Award. Michael finished his journey on November 12, 2011, riding with several hundred cyclists with a homecoming celebration at Rogers Arena in Vancouver. Michael’s mission is to shatter this stigma through open communication and education about mental illness through speaking in schools, workplaces, and with the general public. 3 Responses to "Michael Schratter – Ride Don’t Hide"
I’m trying to find some relatives of mine. My grandmother had a brother living in Canada. His name was Benu Schratter. Is your family from Chernovitz?